In 1964, six teenagers from New Jersey run off to see The Beatles perform on The Ed Sullivan Show in the hope of meeting their idols. Before and after the Beatles, many musical acts inspired hysteria in their fans. Among others, Sinatra, Elvis, Michael Jackson, and myriad “boy bands” led to massive amounts of shrieking and general nuttiness from teen girls. However, the Beatles remain the gold standard of fan craziness. Whenever someone encounters rabidly excited crowds, they don’t say they felt like Elvis - they say they felt like the Beatles. 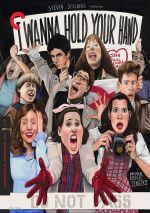 For a wonderful look at the most famous example of Beatlemania, we go to 1978’s I Wanna Hold Your Hand. This movie looks at the panic from the perspective of some New Jersey teenagers, as six of them travel from the Jersey suburbs into Manhattan to go toward the Beatles’ hotel. Each of the six possesses a different motive. Emotional Rosie Petrofsky (Wendie Jo Sperber) is the one true Beatlemaniac, as she absolutely adores the band and fantasizes that she’ll marry Paul. She just wants to get as close to them as she can. Grace Corrigan (Theresa Saldana) wants to be a professional photographer and she thinks that some candid shots of the Beatles would act as her entry into that career. Mild-mannered Larry Dubois (Marc McClure) has a crush on Grace, so he helps out to impress her. Soon-to-elope Pam Mitchell (Nancy Allen) pretends not to care about the Beatles. She and the girls are supposed to hang out for her pre-marriage celebration, but they shanghai her to go into town. She goes along with this even though she thinks she’s too mature to deal with all the craziness and she worries what her fiancé will think. Folkie Janis Goldman (Susan Kendall Newman) loathes the poppy Beatles, so she goes along to protest their influence. Greaser Tony Smerko (Bobby Di Cicco) also dislikes the band, though he mostly accompanies the group to be a jerk and make time with Janis. The film follows a few storylines that revolve around the characters’ interests. Along the way, the kids meet others who share in their adventures. My, what a wonderful movie! 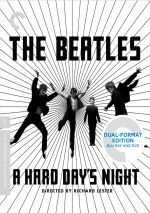 It’d be a mistake to think that only Beatle fans would enjoy this light comedic romp. Instead, it’s really a flick for everybody, as I find it hard to imagine who wouldn’t enjoy this bright and dynamic effort. Granted, it helps to love the Beatles, especially since Hand presents such a delightful “you are there” feel for things. I wasn’t even born in February 1964, but between Hand and the documentary The First US Visit, I think I get a good impression of the hysteria. The documentary lets us see things from the Beatles’ point of view, while Hand gives us the kids’ perspective. It does that in a marvelous manner, as the movie possesses an amazing energy that lets you fly through its scenarios in a peppy and amusing manner. Even with a large ensemble cast of main characters, we still get a great feel for the kids, and they all develop appropriately as the movie progresses. I’ve seen longer movies with many fewer participants that didn’t present such great character progression. Hand really lets us understand them and see them grow, albeit in comic ways. The excellent cast helps. Also seen in Steven Spielberg’s 1979 dud 1941, Deezen plays a small role, but he’s an absolute riot. I’ve loved the broad but pointed comedy of Sperber for years, and she’s great as Rosie, as she gets into the mindset of an obsessed teen fan so well she almost seems possessed. McClure does wonderfully as the sweetly wimpy Larry, as we can see his love-struck attitude and the way it affects his actions. It’s amazing to think that Hand acted as Robert Zemeckis’ first directorial effort. He creates a very self-assured movie on a low-budget and fires on all cylinders. Zemeckis would encounter much greater nox office success with flicks like Back to the Future and Forrest Gump. On the other hand, Hand made about $17 at the box office and sank like a stone. However, he’d never create a better film. I’ve enjoyed a lot of Zemeckis’ work, but Hand remains his best. I Wanna Hold Your Hand appears in an aspect ratio of approximately 1.85:1 on this Blu-ray Disc. This became a terrific presentation. Sharpness worked well. The movie showed fine delineation and suffered from nary a spot of softness, even with the less than stellar film stock in use. No signs of jagged edges or shimmering occurred, and I saw no edge haloes. Print flaws also remained absent. Hand always had a subdued palette, and the disc represented that. This made sense given the period setting and the winter atmosphere. The disc demonstrated the tones well. The colors looked appropriately full and rich, as the occasional examples of brighter hues looked good. Blacks were deep and tight, while shadows seemed clean and accurately displayed. I felt extremely pleased with this positive visual presentation, as it exceeded my expectations. Remixed from the original mono, I Wanna Hold Your Hand offered a DTS-HD MA 5.1 soundtrack. This didn’t try to reinvent the wheel, as it often offered a broad monaural piece. Music and environmental elements spread gently to the sides, and occasionally some more firmly localized bits appeared. For example, cars sometimes moved from one spot to another. Don’t expect stereo presence from the movie’s songs. These spread to the sides but in a “broad mono” way. The surrounds played a fairly minor role and largely supported the front, especially during crowd scene. Nothing about the remix went nuts, but it broadened the atmosphere in a moderate manner. Audio quality was slightly dated but generally good. At times, speech demonstrated mildly hollow tones. However, the lines always seemed clean and intelligible, and they usually came across as pretty natural. Effects didn’t act strongly in the film, but the elements we heard sounded reasonably accurate and distinctive. Music consisted almost solely of Beatle tunes. These were fairly bright and lively, though not extremely dynamic. The quality of the tunes varied from solid to mediocre, with most of the tracks more than acceptable. No one should expect a killer mix from Hand, but it worked reasonably well for the material. How did the Blu-ray compare to the 2004 DVD? Audio remained fairly comparable, as the DTS-HD MA mix added only a little zing to the prior lossy presentation. To my disappointment, neither provided the original monaural audio. Criterion used to pride themselves on their desire to replicate movies close to their theatrical versions, so I don’t know why they left out the 1978 mix. At least visuals became a positive, as the Blu-ray offered obvious improvements in definition, colors and clarity. The absence of the original mono audio disappointed, but the picture showed a nice boost. As for supplements, Hand includes an audio commentary from writer/director Robert Zemeckis and writer/associate producer Bob Gale. Recorded for the 2004 DVD, both men sit together for their running, screen-specific track. While most commentaries spew praise for all involved, this one goes along a different path. The pair seem more than happy to point out a variety of problems they encountered as they made Hand. We learn a little about the origins of the flick and various inspirations, and we also hear about the flick’s path to the screen plus legal issues connected to the band. For the most part, though, they chat about all the issues that popped up along the way. We get remarks about lazy crewmembers, Murray the K’s vanity studio interference and the absence of support. A variety of fun anecdotes like Paul Newman’s directorial statements appear as well in this very entertaining and amusing commentary. It suffers from a little too much dead air, and a couple of factual mistakes occur. For instance, Gale states that they couldn’t depict Brian Epstein because the Beatles’ manager was still alive during the movie’s production, but Epstein actually died more than a decade earlier. Despite those minor problems, this is a solid piece that Hand fans will definitely enjoy. The rest of the extras didn’t appear on the DVD, and we get Spielberg, Zemeckis and Gale, a 2018 piece with Zemeckis, Gale and executive producer Steven Spielberg. All three chat together in this 41-minute, 57-second program. The discussion looks at how the three got to know each other in the 1970s and how they came together for Hand and other projects. We also find notes about bringing the tale to the screen, story/character topics, production areas, and other connected domains. It’s a delight to see three Hollywood legends – and old pals – together, and the chat lives up to expectations. Inevitably, some of the stories echo material in the commentary, but this still becomes a warm, engaging and informative program. Another new discussion, actors Nancy Allen and Marc McClure sit together for their 22-minute, 15-second piece. They talk about how they came to the film, characters/performances, and other movie-related memories. I’m happy the program pairs the actors, even though they don’t interact quite as much as I’d like. Mostly this plays as two separate interviews staged at the same time. Nonetheless, we get some good perspectives and it’s fun to see Allen and McCLure interact when that occurs. Next we find two Early Zemeckis Short Films. The disc includes 1972’s The Lift (7:21) and 1973’s A Field of Honor (14:16). A dialogue-free effort, Lift deals with an ordinary office worker frustrated with an elevator. Honor shows a man who gets out of psychiatric care but immediately finds himself beset by societal issues. Of the two, Honor offers the more interesting, mainly because it comes as a clear indication of Zemeckis’s later work. One can clearly see the manic comedy of 1941 and Used Cars. Also, composer Elmer Bernstein previews his score for 1981’s Stripes. As for Lift, it seems more like an idea for a film than an actual coherent tale. In any case, both are fun to see for historical reasons. In addition to the film’s trailer and six radio spots, we find a booklet. This insert provides credits, photos and an essay from critic Scott Tobias. It’s not one of Criterion’s best booklets but it adds some value. A true gem of a film, I Wanna Hold Your Hand gives us a delightful look at Beatlemania through the eyes of the fans. Hilarious, charming, and even a little touching at times, it’s an excellent flick. The Blu-ray boasts excellent visuals and a nice set of supplements, but I feel disappointed that we get an inconsistent 5.1 remix instead of the original monaural audio. Despite that issue, I feel very happy with this nice release of a great film.